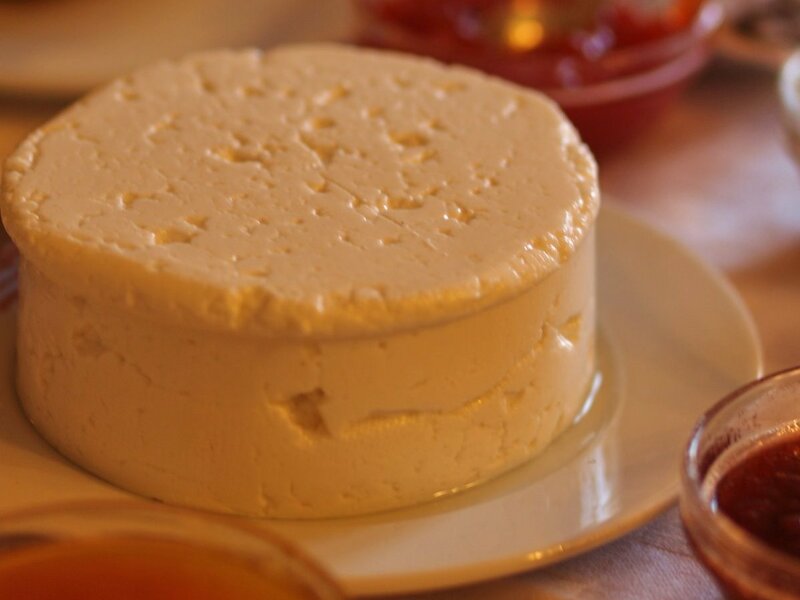 Queijo Fresco, or Portuguese Fresh cheese is a favorite in Portuguese cuisine that is very easy to make at home. Queijo fresco is a very light cheese with a lot of moisture that is most similar to Pot Cheese or Farmer Cheese. This is a delicious dish that has an unbelievably unique texture and flavor that makes it one of the most popular Portuguese foods to eat. It can be made with either cow’s milk or goats milk. It is perfect to be eaten on some toasted bread with some tea or coffee at any time during the day. 1) Warm the cow’s or goat’s milk on the stove, but don’t boil it. 2) In a large bowl mix the rennet and salt together and the pour the warm milk on top. Mix. 3) Let it sit for a few minutes, you will see that the whey will start to separate from the cheese. You can now start spooning the cheese into the cheese molds. Fill the molds as much as you can, while letting the liquid drain out of the mold. For the rest of the day keep draining out the liquid by tilting the mold or just using a spoon. You have just made Homemade fresh cheese. 4) This can last in the refrigerator for about 2 to 3 days. yes she did…third ingredient…at the top !!!??? you have some awesome recipes. i want to make the queijo fresco. Where can I buy the plastic forms to load the cheese into? You can make them from used plastics tubs from things like margarine or spread. Just cut it to the height that you want and drill holes all around the sides. Fill the tub with the mix then put a plate on top snd flip it. The extra water will slowly weep from the holes until its ready. Greetings. When warming the milk on the stove, is it low or medium heat? George, the milk is warmed on medium heat. Raw milk or pasturized ? tried making this today did not work ,any idea on what went wrong,thanks. That is unfortunate to hear. What exactly went wrong during the cooking process? Hi, what temp was the milk when you used it? 1 teaspoon or 1 tablespoom? 1 teaspoon. I misspoke in the video but the correct amount is shown. I’m guessing you use whole milk only, not 2% or 1%. Is that correct? Whole milk should typically only be used because of the fat content that is necessary to make the cheese. Mine didn’t work either – the whey never separated – not sure why not. Junket brand rennet will NOT work for making cheese. It has starch and other stuff in it and it’s far “weaker” than rennet for cheese. I learned the hard way. I have made the queijo fresco succesfully with the junket version of rennet tablets but have heard others having difficulties using it. Do you know of a rennet tablet which would work best for this type of cheese? Thank you. I made the Portuguese Fresh Cheese using the cardboard/wax milk containers as the molds , in the quarts or half gallon size. The fresh Cheese came out good. Just want to jump in here and say, you should NOT USE PVC for molds. PVC can and will leach chemicals from the plastic into your cheese. For your health’s sake please use only food grade plastic items to make your molds.